By connecting your Google Analytics and Google Search Console accounts to SEMrush, you can analyze all of your website’s data from one central location - the SEMrush user interface. If you ever need to disconnect your Google Account from SEMrush, you can follow these steps. 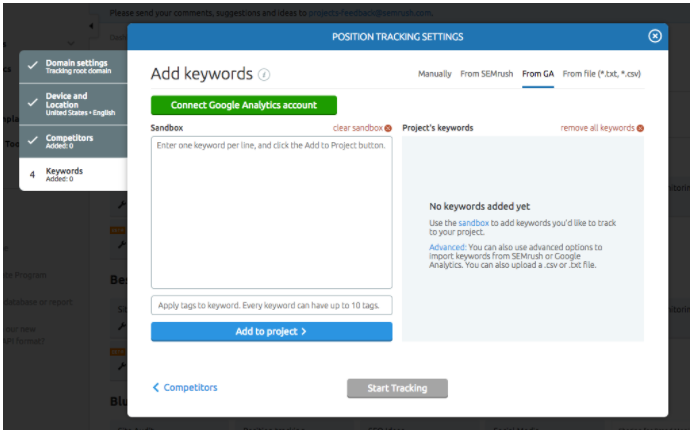 Connection: Position Tracking can import keywords directly from Google Analytics into a Position Tracking campaign. 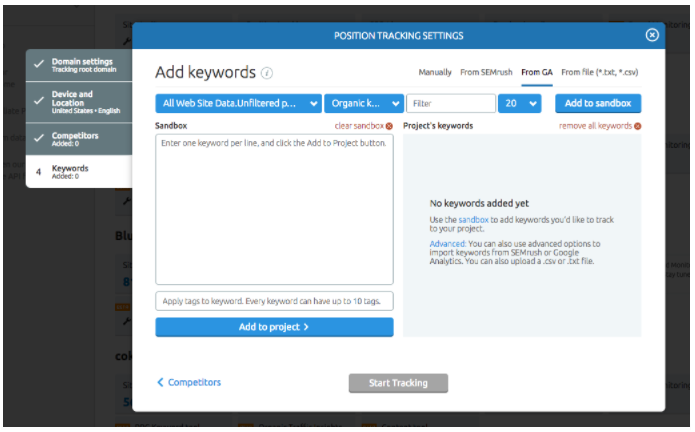 Position Tracking is one of our most popular tools in the Projects section. It allows you to track daily keyword rankings on any device in any location around the world. This tool can provide you with organic or paid keyword data. Campaigns can be centered around a domain and up to 20 competing domains. For each added competitor, you can measure visibility %, estimated traffic and average position for all of the target keywords. By importing keywords directly from your Google Analytics, you can ensure that SEMrush is gathering data on every single keyword that your website is ranking for on Google. By selecting the From GA option, you will then be asked to Connect your Google Analytics account by entering your Google Analytics email and password. Once you connect your account, you will then be asked to select your data from Google Analytics. After choosing your site data, you will then be asked to select if you want to see your organic or paid keywords to add to your sandbox. Once you make your selection, press the “Add to Sandbox” button to reveal these keywords. Importing keywords directly from Google Analytics allows you to skip the guesswork and seamlessly track the keywords that your website is already ranking for. Connections: On Page SEO Checker can import keywords and their corresponding landing pages directly from GSC & provide user experience recommendations based GA metrics (bounce rate, time on page & page load time). On Page SEO checker offers advice for optimizing landing pages to rank higher for your target keywords. Depending on who is ranking in the top 10 positions for a target keyword, SEMrush will provide suggestions for your set landing page to have it rank higher for a particular keyword. If you connect your Google Search Console account to On Page SEO Checker, you can automatically import the landing pages and keywords that your website is ranking for. By connecting Google Analytics, SEMrush can display bounce rate, time on page and page load time to provide ideas where you need to improve a page and user experience. You can enable your Google Search Console account to connect with your On Page SEO Checker through the configuration wizard when you create your campaign. The first step in the wizard is choosing your site’s landing pages and corresponding keywords to target. The five options you have are Auto Import, Manual, File, Google Search Console, and Organic Research. Choose Google Search Console from this list and enter your login information to connect your GSC account to SEMrush. You can also add keywords and landing pages directly from the On Page SEO Сhecker interface. 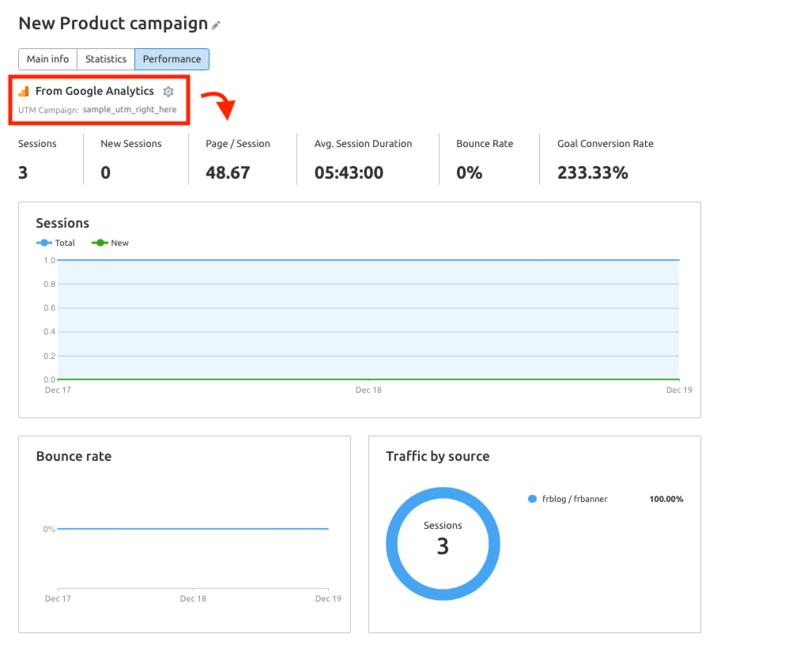 Connecting Google Analytics can be done from the Overview tab after your campaign has been started. Next to the User Experience Ideas is a button to connect GA. Click this button and enter your email and password for your GA account. You can also get there from the Settings gear. In the next window you’ll be asked to specify the correct property and view from GA to connect to your Project. After connecting, SEMrush will begin to gather User Experience data for your landing pages. These integrations will enhance the quality of your ideas report, making it easier to see exactly where you should improve the content on your website. Connections: Connecting Google Search Console to Backlink Audit synchronizes SEMrush’s backlink data with your real-time backlink list from GSC and keeps your disavow file up to date. Connecting Google Analytics tells SEMrush if any backlinks are bringing in significant traffic and therefore should not be considered toxic in our analysis. The Backlink Audit tool reviews a website's backlink profile and determines if it has any toxic links that should be disavowed. However, it may take some time for SEMrush to add your most recent backlinks to our database. By connecting your Google Search Console account, you will be syncing your domain’s real-time backlinks with SEMrush’s analysis of your backlinks. You will also be able to compose a Disavow file in SEMrush that can be uploaded to Google Disavow Tool. By connecting your Google Analytics account, you guarantee that you’re looking at the most accurate traffic analysis of links in your Backlink Audit. This connection gives us information about the traffic coming from your backlinks. With this information, we will avoid labeling any of your traffic-bringing links as toxic so you can keep the links that help your site get more visitors. 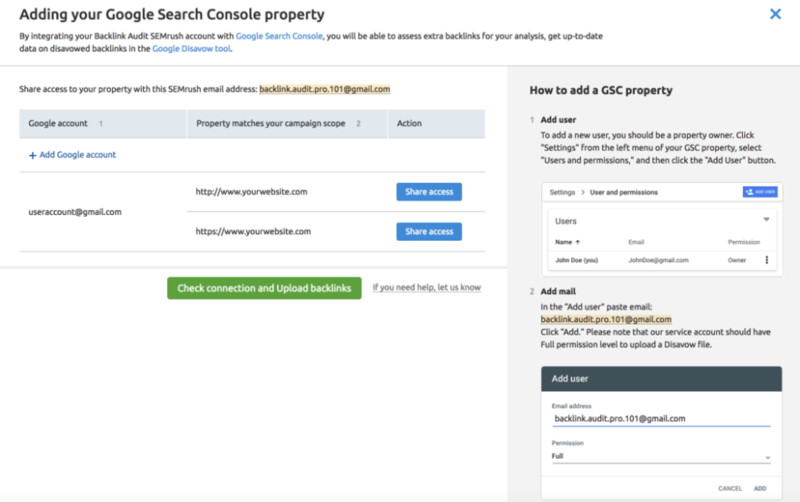 To connect, you’ll need to share access to a specific Google Search Console property (or properties) with a backlink.audit email address, which then exports backlinks data from GSC and adds it to your Backlink Audit in SEMrush. Only links to the specific domain are analysed, and only if the limit of 500 links from a domain is not yet reached. This will ensure that the information in your Backlink Audit on SEMrush is in line with what GSC sees in your backlink profile. Another benefit of integrating GSC with Backlink Audit is that you can receive up to date information on the backlinks you’ve chosen to disavow. Once Google disavows the links you ask it to in the Disavow Tool, these URLs will be automatically updated within your SEMrush project once you upload them from Google. After you’ve started your Backlink Audit, navigate to the top right of your report and select integrations. From here you will be able to select Google Search Console. Follow the prompt to add your Google account to SEMrush. SEMrush automatically chooses the properties that match your campaign scope. Make sure to connect both Google Search Console and Google Analytics to fully support your campaign. Click on “Add Google Account” to pass through the Google Authorization process. If you already have an account listed here, you can click “Share access” in the Action column. If the button says “Shared,” it means that we already have access to the property. 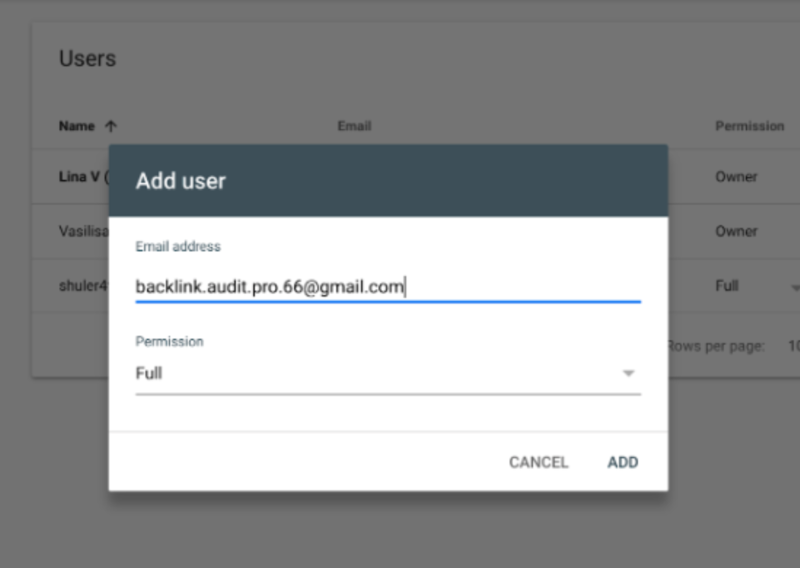 To share access you need to copy/paste Backlink Audit email and add the user in Google Search Console. To do this, go to Google Search Console and navigate to your Settings. Select “Users and permissions” and “Add User.” In order to add a user, you need to be a property owner. Enter the backlink.audit email address provided to you and choose “Full” permissions to share access. Please note that our service should have full permission to upload a Disavow file. After you’ve added the user, click on the button in Backlink Audit that says “Check connection and Upload backlinks.” You can see all of the properties you’ve shared with SEMrush in the “Integrations” dropdown in Backlink Audit. It is important for you to be careful and add all Google accounts that has properties match your campaign scope to ensure you are not missing out on any data. Please look at the list of properties that we’ve found and if you notice that you have more than one property for your domain (commonly websites have a “http” and “https” property) then you should add this property to SEMrush as well. 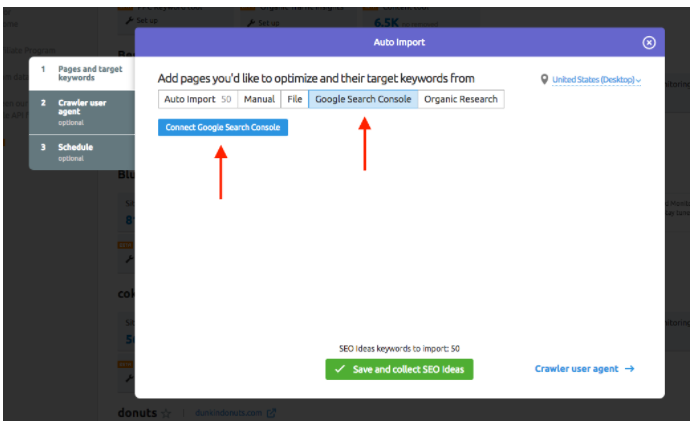 If you’ve already connected Google Search Console to SEMrush in another tool, you won’t need to connect again in Backlink Audit. 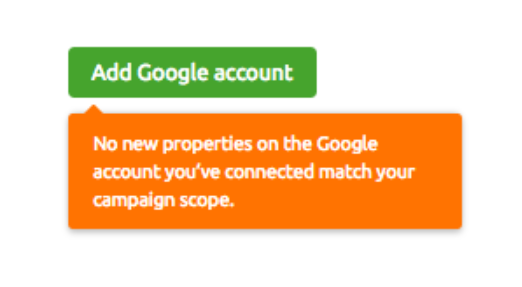 We can see all of the connected properties in your GSC and will show the properties that match your campaign scope. If for some reason the connection is not working, then it is either because we have no access to Google Analytics or you have no properties in Google Search Console that match the scope of your Backlink Audit campaign. There will be an orange message in the SEMrush interface telling you the reason why. In addition to its integration with Google, Backlink Audit can also import backlinks from a Majestic account if you have one (up to 10 backlinks from every referring domain you have data from in Majestic). Combining both Google Analytics and Google Search Console along with SEMrush and Majestic data into one audit gives you the widest and most accurate scope of data to review your website’s backlinks. 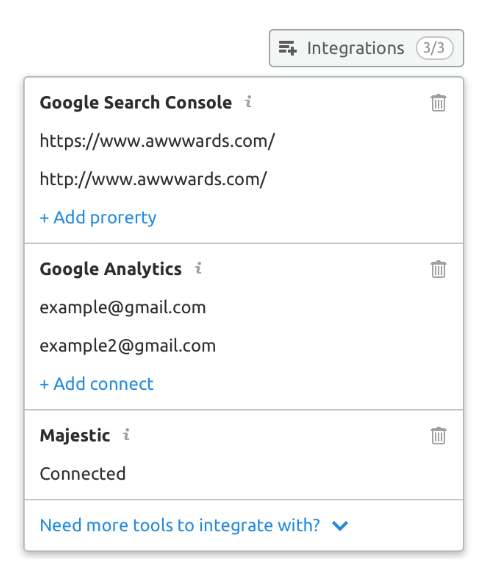 In order to connect your Google Analytics, click on the integrations tab the same way you would for GSC. After connecting your GA account you will be able to see updated data on your backlink profile’s toxic scores based on the traffic that each link is sending to your site. This can cause some of your toxic scores to lower so that you can avoid making the decision to remove valuable backlinks that are driving actual traffic to your domain. In addition to your GA and GSC accounts, you can also pair your Gmail account to the tool to manually request the removal of backlinks via sending an email request to the website that’s giving you the backlinks. Connections: Connecting Google Analytics to Organic Traffic Insights will help you identify your “(not provided) keywords” and post-click data (Bounce Rate, Goal Completions) in SEMrush. Connecting Google Search Console to the report will let you analyze pre-click data (Impressions, Position). The Organic Traffic Insights tool allows users to integrate both Google Analytics and Google Search Console data into one project. This allows you to access all of the backend information for your website in one location. You no longer need to go tab to tab in order to evaluate all the information you need. This combination makes it easy to look at all of your internal analytics on one screen. The first step in setting up Organic Traffic Insights is connecting your Google Analytics account by allowing SEMrush to have offline access to your data. Once access is granted you can choose which property you want to link to SEMrush. With Google Analytics you are able to have multiple accounts linking to a single email. With this in mind, the SEMrush Organic Traffic Insights gives you the option to specify which account is synced. To sync your Google Search Console account, open your Organic Traffic Insights campaign and find where it says “Google Search Console” under the Keywords column. If you hover your mouse over N/A, you can connect your GSC account by entering your email and password. 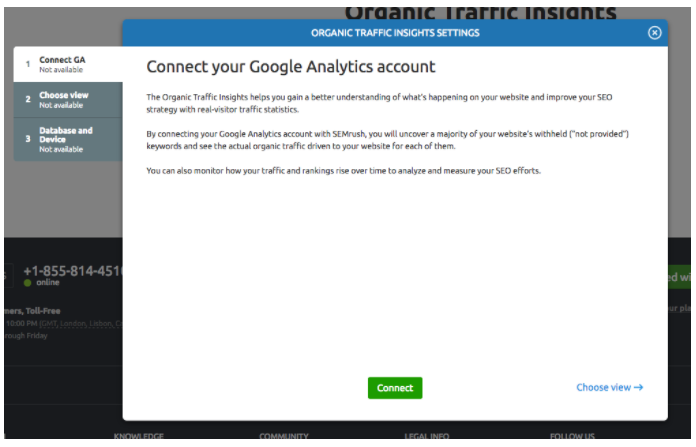 Additionally, you can sync your accounts directly from the setup wizard when first starting an Organic Traffic Insights project. After connecting both Google Analytics and Google Search Console to SEMrush, your Organic Traffic Insights campaign will be able to house all of your valuable analytics and data for your website. Connection: In My Reports you can add widgets with Google Analytics and Google Search Console reports to any Custom PDF Report. My Reports on SEMrush allows you to create custom PDFs combining data from multiple areas of the software. In addition to integrating SEMrush data into a report, you are also able to add widgets from both Google Analytics and Google Search Console allowing you the added functionality to report out the most valuable and relevant performance data from SEMrush as well as Google. 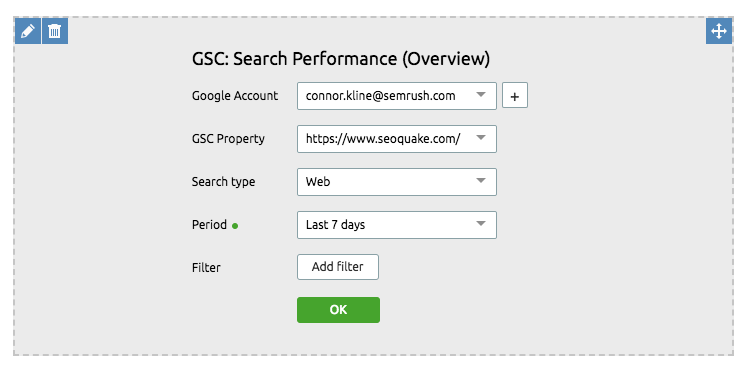 If you want to add Google data into a custom PDF, you first need to connect both GA and GSC to your SEMrush account by verifying the properties when you drag and drop a widget into the Report Builder. Once your accounts are connected, simply drag and drop any widget from the Report Builder left menu and select the parameters of data that you want to show. My Reports currently allows for 11 different GA widgets ranging from data such as Overview reports all the way to search referral reports. Just like with Google Analytics widgets, simply drag and drop any GSC widget to add it to your report. After you drag the widget into your report, you’ll be asked to choose the Google Account, property and report that you want to add to the report. 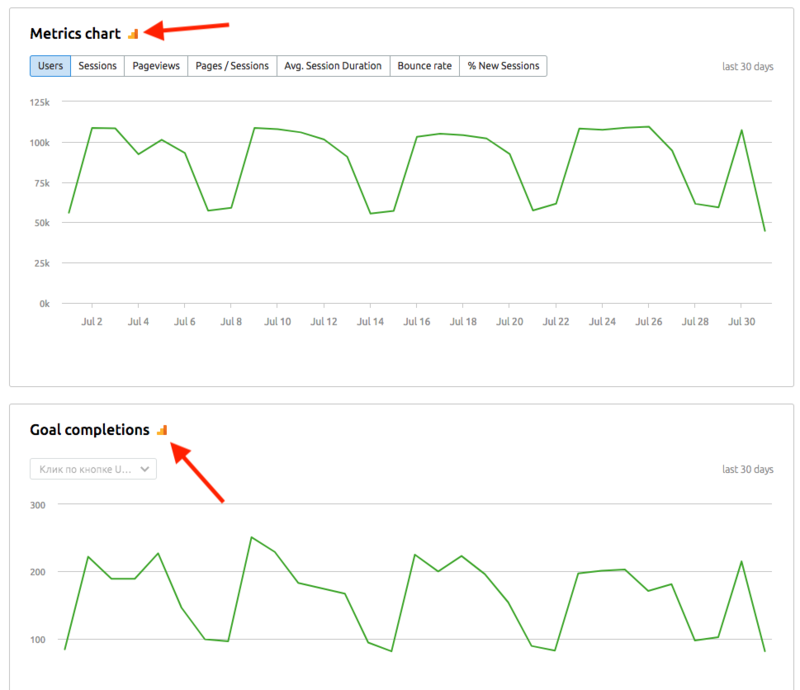 Right now the options for widgets to add include GSC Search Performance Overview, Data by Category or a Metrics chart. With both GA and GSC widgets you are able to specify the time period of your widget (last 30 days, last week, custom, etc). When selecting your time period it's important to note the difference between the “last 7 days” filter vs the “last week” filter. The last week filter will pull data from either the most recent Monday through Sunday or Sunday through Saturday. cannot take data from the 3 most recent days. So for example, if you are pulling data on the 15th with a “last 7 days filter,” this data will actually be from the 5th to the 11th of the month. However, if you pull a report on a Sunday and select “last week,” this will gather information on the most recent 7 days. Adding unique pageviews of each page in your Site Audit makes it easier to prioritize the pages that should be addressed first, as you can sort by pageviews and identify the most popular pages on your site that have issues. These both present opportunities for improvement, as you should add links to the orphaned pages and optimize the code of the pages that take too long to load to improve the user experience of your website. First, go to your Site Audit project and navigate to your settings. Find the item in the menu that says "Google Analytics" and choose the account and property for the domain you're auditing. Keep in mind you may need to wait around 15 minutes for your GA data to appear under your crawled pages. After this initial crawl, your GA data will automatically be updated any time you re-run your Site Audit. To analyze sort by unique pageviews, simply check your crawled pages report. Connections: When you connect Google Analytics to a Content Audit, your audit table will be able to include data on the number of sessions, pageviews and bounce rate associated with each page. When you connect Google Search Console, your audit will be able to also show data on the top 5 search queries for each URL as well as the total number of search queries bringing traffic to each page. Pairing your Content Analyzer with both your Google Analytics and Search Console accounts will ensure that you are getting the most complete and up to date data for your articles. This will allow you to see the popularity and priority of the different pages you’re auditing. Connecting your Google accounts with Content Analyzer is quick and easy! Simply go to your Content Analyzer project and click on the connect buttons directly below Google Analytics/Google Search Console. Connection: Connecting Google Search Console to a Link Building Tool campaign will make sure you avoid adding domains to your list of targets that you already have links from according to your GSC data. When you sync your GSC account to the Link Building Tool, SEMrush will see which domains are already linking to you to update our recommendations to avoid recommending any backlink prospects that you already have links from. 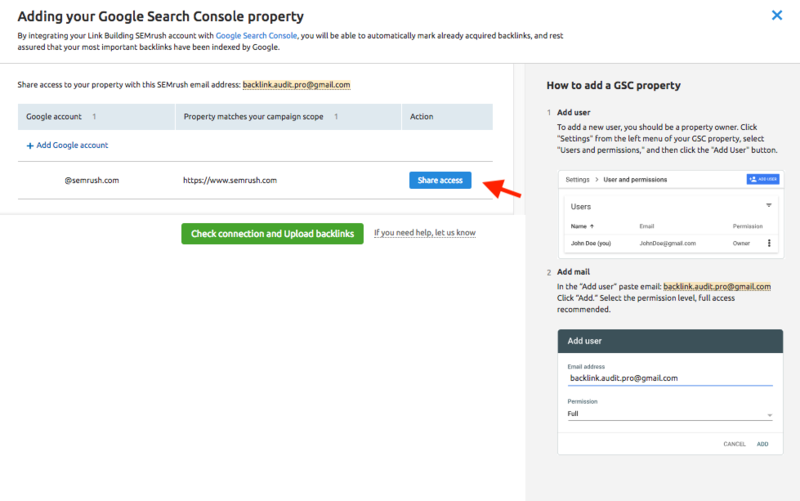 To connect your Google account with the Link Building Tool, locate the connect GSC button directly at the top where it says Google Search Console. From here you will be directed to the setup window which will explain the final steps on your setup. If you’ve already connected the same GSC property to your SEMrush account, it will be listed as an option. Choose “Share access” to connect. If this is the first time you’re connecting GSC to SEMrush, you’ll be instructed to log into your GSC account and connect the correct property to SEMrush the same way you would connect it to Backlink Audit. Connections: Connect your domain's GA and GSC data into the SEO dashboard on SEMrush to manage an SEO dashboard with your website’s overall search performance into one place. SEO Dashboard gives you the ability to analyze all of your SEO needs in one easy to navigate interface. This data becomes even more precise when you pair it with your Google Analytics and Search Console accounts. You are able to pair your GA and GSC accounts with your SEO Dashboard in one click, all you need to do is click on the connect button to begin getting the most accurate data for your SEO needs. You will see your website’s Sessions, Unique Visitors, Pages/Visits, Avg/Visit Duration and Bounce Rate. Not only that but you will also see GA data for GEO distribution, Visits, Metrics chart and Goal Completions. An easier way to tell that any data is pulled from Google Analytics is by the small orange bar graph next to the widget. Once your GSC is paired with SEO dashboard you will be given even more data, this includes total clicks, total impressions, average CTR and average position. You can see all of this data in an interactive graph. Keep in mind, SEMrush will never store data from a connected Google Analytics or Google Search Console account. The sole reason for allowing you to connect your Google accounts to SEMrush is for your convenience. 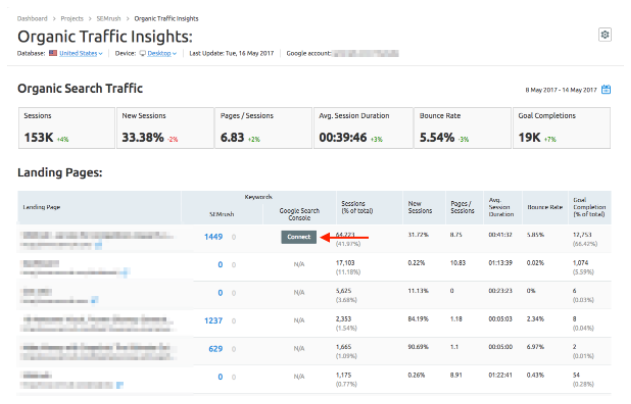 Connection: When you connect Google Analytics to Brand Monitoring you can see how much referral traffic your site receives from branded mentions that include backlinks. 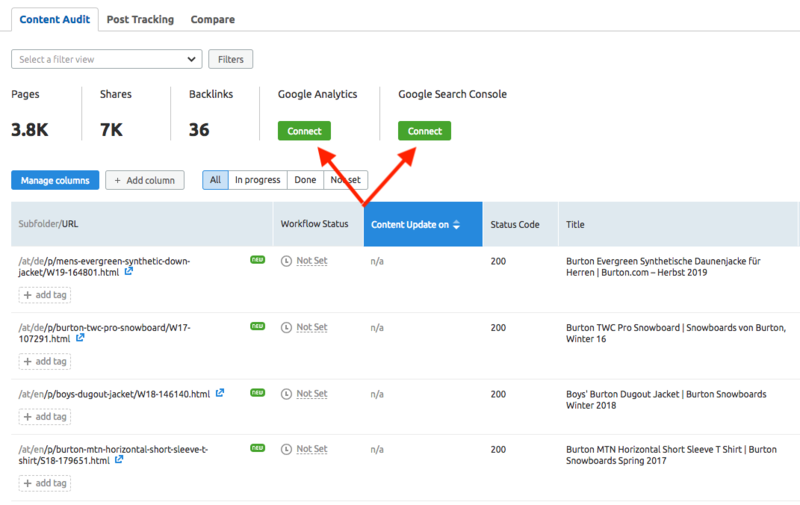 To Connect GA to Brand Monitoring, find the “Top Backlinks” table under the Statistics tab after selecting the “Backlinks” button at the top of the report. Select the gear icon above the top backlinks table and choose “Connect GA”. Once your Google Analytics is connected, you will be able to toggle GA data on and off to see each page's total number of referral visits from each mention over the selected time frame in a new column. 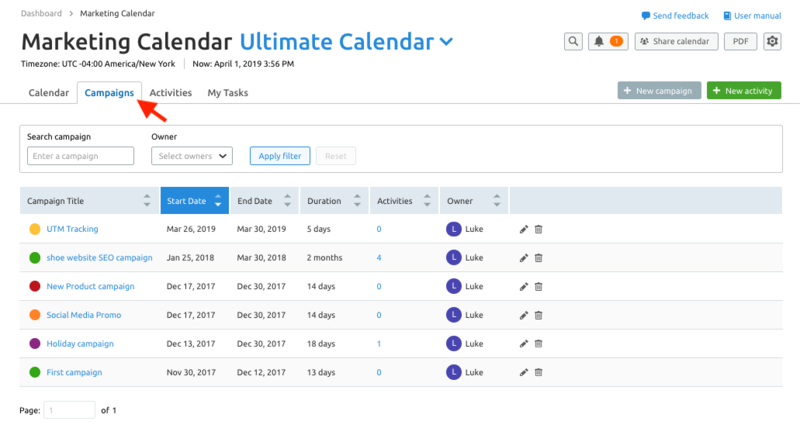 Connection: If you run campaigns with UTMs, you can add these tags to your campaign tasks in Marketing Calendar and track how your campaign performs in the Performance tab in the Marketing Calendar tool. To connect, go to your Marketing Calendar and find the Campaign tab related to your UTMs. Once you are viewing a campaign, select Performance. Click the button that says GA Settings. Then you will be asked to connect your GA account and select the UTM tracking code from a drop down menu. UTMs from your campaigns will be found here. Select one and then the report will populate with data about traffic from your specified campaign.